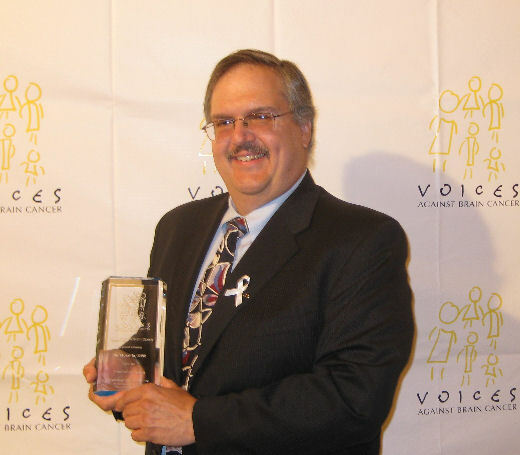 June 4, 2009: Dr Musella Receives 2009 Voices Award for "dedication and charitable giving to brain cancer research and support", from Voices Against Brain Cancer. The award is presented each year to a patient, caregiver, volunteer, corporation or benefactor who has shown extraordinary and unique courage, resourcefulness and ingenuity in battling brain tumors - and in doing so, has given hope to others. Our website was the only source of brain tumor treatment information mentioned by the FDA in the federal register. Click here to pop up a copy of it. We are mentioned on page 3 of that file. 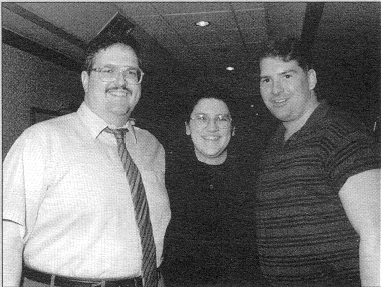 Dr. Al Musella, Conference Honoree; Samantha Scolamiero, founder of the Brain Tumor Mailing List; and Steve Depesa during the 1998 National Conference. Al Musella, DPM was honored at the NBTF's conference for his work in providing clinical trial information on the internet. 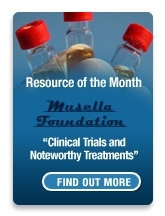 Dr. Musella has provided free information to over 70,000 people a year who visit his web site at www.virtualtrials.com. Dr. Musella has also begun a new project to track the outcomes of brain tumor treatments that may improve survival rates or eventually cure brain tumors. During his acceptance speech, Dr. Musella spoke about his search for treatment information for his sister-in-law's diagnosis and the subsequent development of his own web site. "I strongly believe that patients should be actively involved in choosing their own treatments and should have access to resources required to make an informaed decision". Endorsed by the South Florida Brain Tumor Association. The National Brain Tumor Foundation salutes Dr. Al Musella and his volunteers for their important work in providing life-saving information to brain tumor patients and their families. For additional information about brain tumors, please visit the NBTF web site or call 1.800.934.CURE. "This site is a listed resource of the Children's Brain Tumor Foundation, New York City. CBTF applauds Dr. Al Musella's work in providing valuable information to brain tumor patients and their families." We were awarded 5 stars by Health A to Z! "This site has been selected for inclusion in CiteLine Internet research software. CiteLine recognizes its quality of content, usability and value to healthcare professionals."